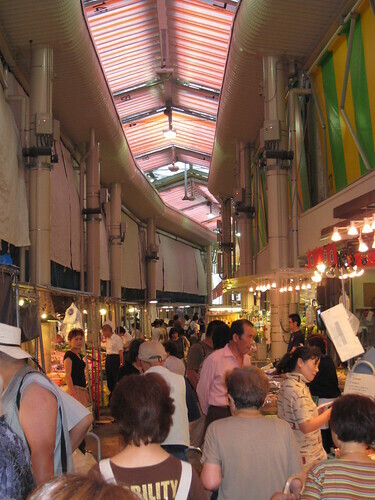 Like most first-world countries, most of the open-air markets in Japan have been replaced by supermarkets and corner grocery stores. 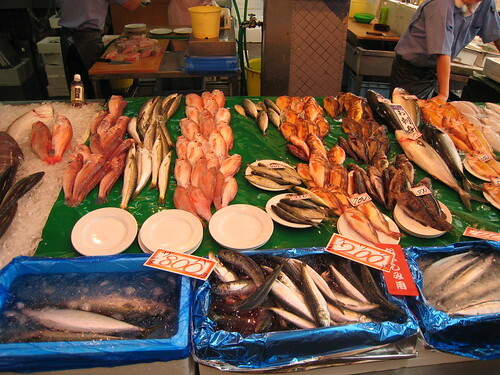 In the city of Kanazawa, however, there is stilla famous and popular fish market: Ohmicho Ichiba(近江町市場). I visited this past summer during my vacation, and I made sure to bring my camera with me as I strolled along the alleys of the market. Don’t be too shocked by the prices! 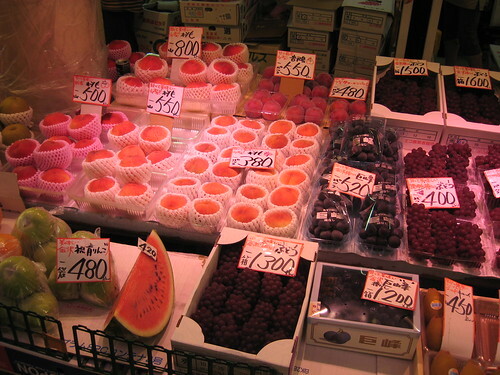 You have to barter and talk with the shop owners or you will truly be ripped off if you pay the sticker price. 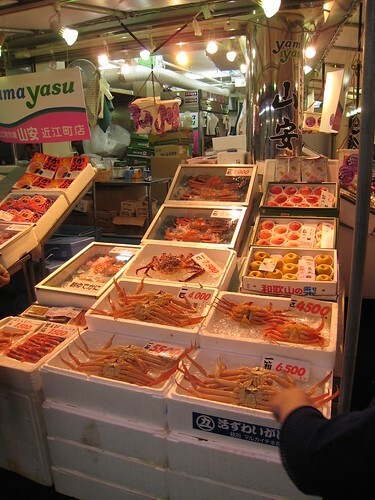 The owners really want to sell the crabs and they will offer very affordable combinations of different crabs, shrimp and whatever else they sell. 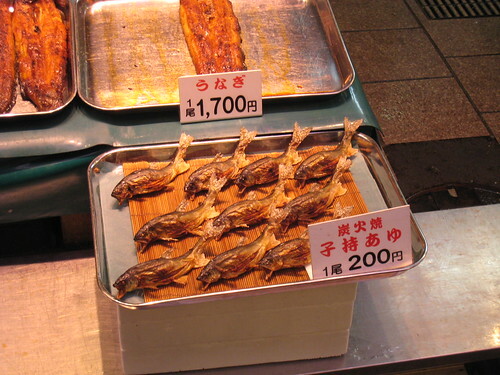 You won’t find deals like this in your local grocery store or fish market back in Kanto. 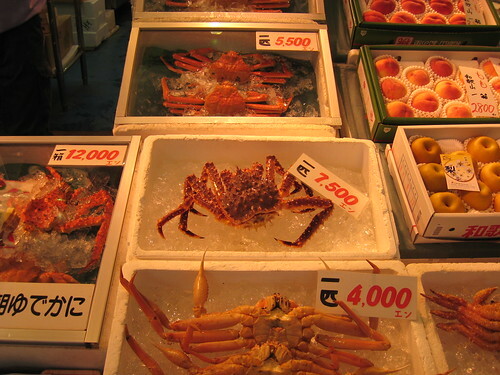 It is not all raw seafood products. 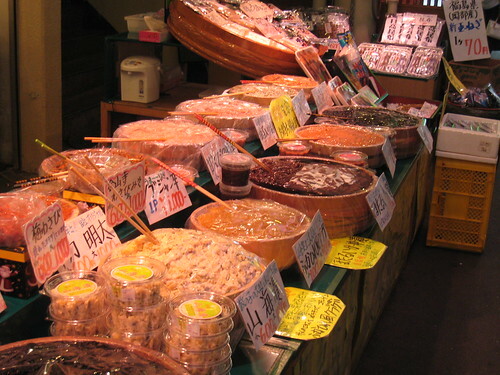 This stall is selling cooked eel (鰻 unagi) and impregnated sweetfish (子持ち鮎). While I love the eel, I don’t care much for the sweetfish. 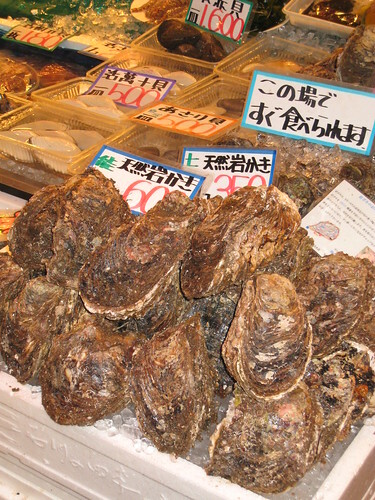 However, many Japanese like to eat this while drinking beer or sake because the the egg sack part of the fish and eggs are is extremely bitter, and they “go well” with alcohol. 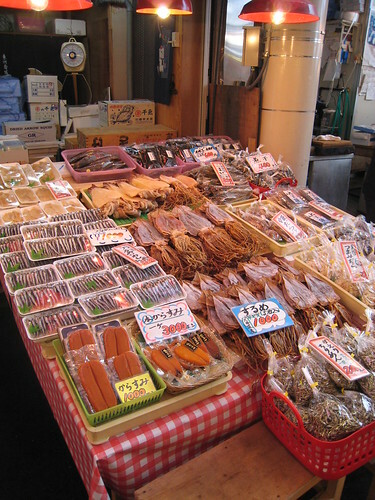 Assorted dried seafoods like squid (烏賊 ika), sardines (鰯 iwashi) and more. 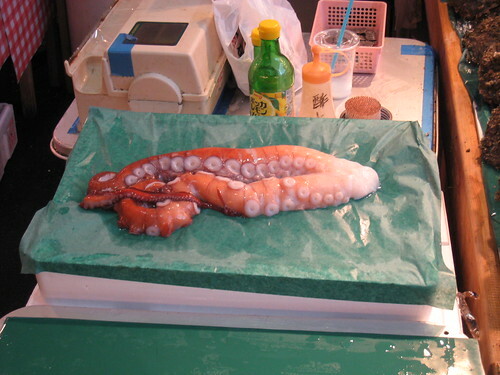 Fresh octopus (蛸 tako), anyone? 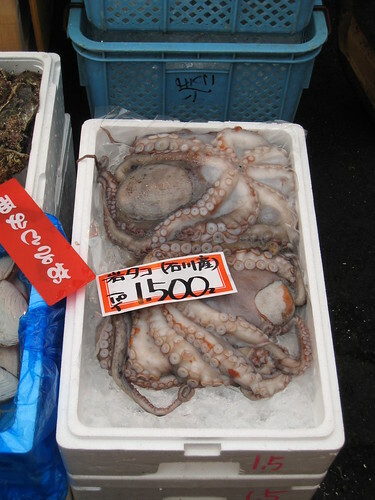 Octopus is great either raw (very “chewy”) or boiled and then dipped in soy sauce and wasabi. 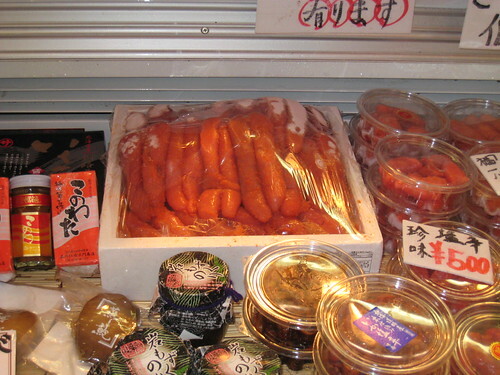 There are also plenty of fabulous Italian recipies for octopus as well. 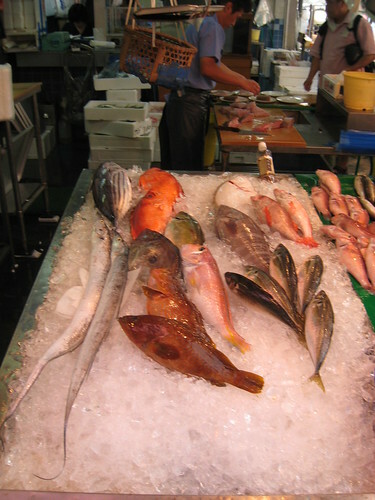 Assorted varities of fresh fish — I don’t even know the name of most of these. What? 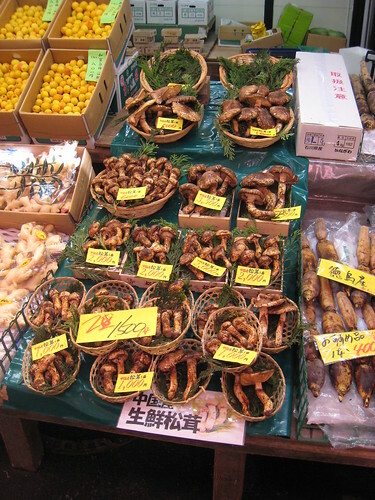 150 yen for an ear of corn?!?! 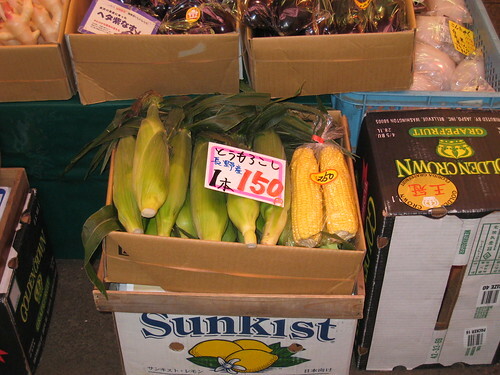 Sometimes I really miss North America where I could buy six ears of corn for 100 yen, wrap them in foil, and throw them on the grill for a simple dinner. No soy sauce and no butter though, please! 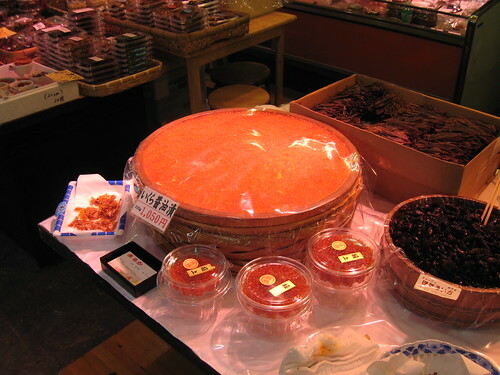 Pollack roe (明太子 mentaiko), which is a bit spicy, can be found in all sorts of Japanese dishes: Japanese-style pasta, topping for a bowl of rice, mixed with vegetables in appetizers, and so on. 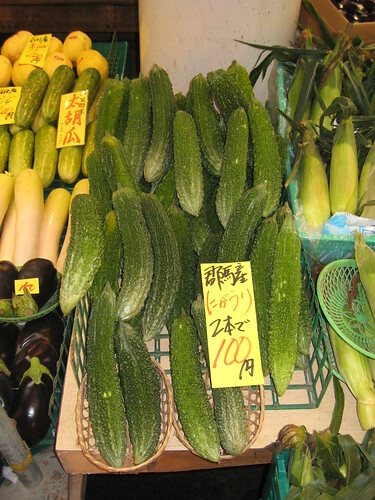 Bitter melons (ゴーヤ goya) — a common ingredient in Okinawan cooking. 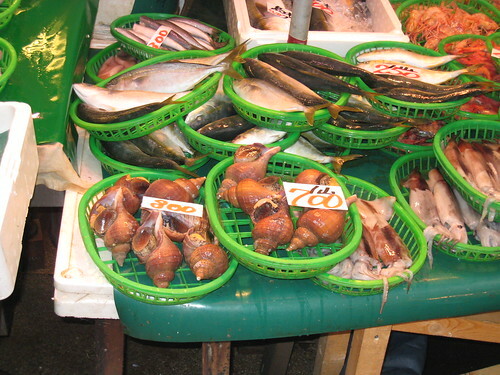 It is also very common in Vietnamese cuisine, where it is known as Khô qua. 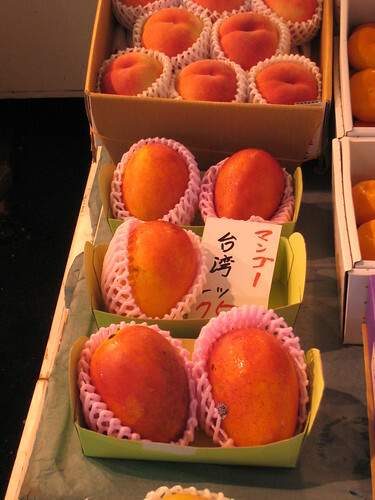 Taiwanese Mangos — I prefer these to Philippine mangoes and like them as much as Mexican mangos. Of course I would never turn down a mango of any kind. I hope you enjoyed the tour. 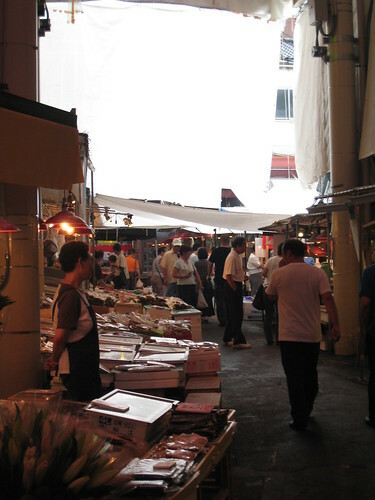 I highly recommending stopping by in the morning, preferrably right after it opens, and enjoying the sights of the market yourself. One of my colleagues at work recently came back from a trip back to his home in Taiwan. He saw I had a box of Taiwan High Mountain tea on my desk and told me he’d bring me back some tea. Apparently his dad received a lot of tea as gifts, but the man does not drink tea–something I cannot fathom–and he’d bring me back Alishan High Mountain tea. This is a tightly rolled tea with a light, distinctive fragrance. It is grown at an elevation of 1000 to 1400 metres. There is only a short period during the growing season when the sun is strong, which results in a sweeter and less astringent brew. 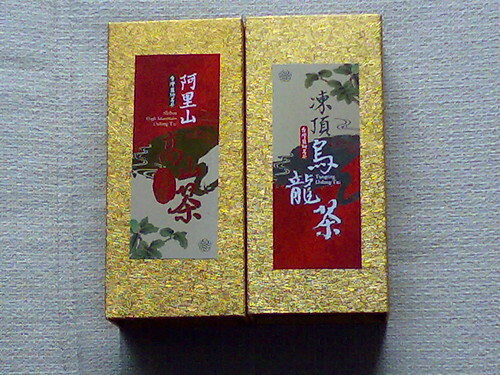 It produces a golden yellow tea which has a unique fruity aroma. This is my new blog, superceeding the former at A Walk in Hachioji, which I started back in 2006. Life moves fast, doesn’t it? I meant for that blog to be about my life in Japan as an expat working in Japanese companies, but starting it after two years of living and working in Japan meant that what was so novel and interesting at first became something I no longer noticed or would even think to write about. I wanted to move all of the posts and comments and what not from that blog, but because I uploaded the pictures directly to the server, they cannot be transfered. Though I wish I could bring all of my photo posts from my travel in Taiwan and my walks around Hachioji, I am just going to have to start over again. Lesson learned though, this time I’ll be using flickr for photo hosting. I have decided not to theme this blog on any sort of topics, I’ll just write about whatever interests me, hopefully share some interesting photos from time to time, and rant about whatever annoys me. The ranting being essentially a way to channel stress, and thus, having conversations with myself at the tea house. If you read my blog you’ll understand the tea house thing I suppose. Thanks for stopping by!